CELEBRATED Bahraini fashion designer Lulwa Al Amin will showcase her latest collection at the Al Riwaq Art Space in Adliya tomorrow. The London-based entrepreneur, who first revealed her talents during Paris Fashion Week earlier this year, is excited about bringing her exclusive range for autumn/winter 2011 rock 'n' roll wear back home. Her collection will include an array of 12 designs, unique and distinguished by their prints and featuring a theme that is inspired by Elvis Presley's home, Graceland. Lulwa's work is a combination of digital and handwork patterns and prints inspired by specific themes. Taking her Bahraini roots into consideration, she also often employs the 'nakda' technique in her designs. Lulwa, 24, said: "I am very interested in the nakda - a traditional pattern in Bahrain. The skill is now on the verge of being extinct as the younger generations don't appear to be as interested in the art anymore. "My mother's aunt taught me the design and I have introduced it to my work digitally." The young designer, from Muharraq, also uses silk lining in most of her designs because she feels that it is an age-old technique to add a luxurious touch to garments and simply makes women feel great. She said: "Dresses nowadays don't generally come with any lining. I thought of introducing this into my designs as I want to sell something that makes a woman feel special." The silk fabric she uses is in coral pink, her signature design colour. The idea behind the connection developed after Lulwa watched an Elvis Presley movie, featuring the late star's concert in Hawaii. She diligently followed up with research on the singing legend and came across images of his former home Graceland, which is now a major tourist attraction in the US. She also discovered a book of recipes from its kitchens and it inspired a colour palette and textures for the clothing designs. Lulwa moved to London to continue her studies and enrolled in a Foundation Course in Fashion at the Central St Martin College of Art & Design in 2004. She said: "At the time I wasn't sure if it was really fashion that I wanted to get into. However, a year later I decided to focus on fashion designing and noticed that I had a flair for prints." Having found her fashion niche, Lulwa enrolled for a BA Degree in Textile Design for Women and graduated last year. After gaining work experience as an intern with renowned designer Matthew Williamson and clothing retailer Browns, she launched her own brand - Lulwa Al Amin in London. She showcased her first collection at the Vandome Luxury Trade Show in Paris which combines chic and creativity and provides a special trading space for buyers from around the world and a place to meet the press. Critics were impressed with her work, some comparing it with the designs of the late Alexander McQueen whose tendency was to juxtapose female strength and sensuality with fragility in his collections. It was not the first compliment she received. One thrilled admirer told her shortly after a show at college that she was so overcome by one dress that she would like to be buried in it. "I know it sounded shocking but I suppose it was quite flattering too - some people like to be buried looking their best!" explained Lulwa. She can't wait for the reaction the collection receives from Bahraini fashionistas. She said: "This is a special event for Bahrain and also for my friends and family who urged me to stage the show. Not many people are aware of what I do in Bahrain and through this exhibition I will be able to promote my brand here." Although she may be a new name on the fashion scene, many will have seen her work. 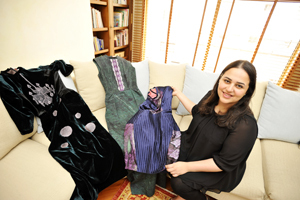 She designed many costumes for a show held during the Bahrain National Day last December. The former Ibn Khuldoon School student first caught the design bug as a schoolgirl. She said: "When I was in my fourth grade, my uncle was getting married and my mother bought a stack of Vogue magazines to look for dress designs. "I was captivated and remember sketching out a Versace dress with slight alterations as I added my own elements. That's when I first realised that I had a fashion streak in me. Now I'm always sketching and creating fashion illustrations." Lulwa says her family - businessman father Rashid and mother Salwa, an interior designer, brother Hassan and sister Mariam - have been very supportive. "They always encourage me, particularly when times are hard and you feel like quitting," she said. Although currently based in London, Lulwa plans one day to return home and set up a design studio here. She said: "I generally do orders for boutiques and department stores. Within a few years time I hope to set up a studio here and work between London and Bahrain." Her collection will be on display from 10am to 10pm and items will be available to order starting from BD100.